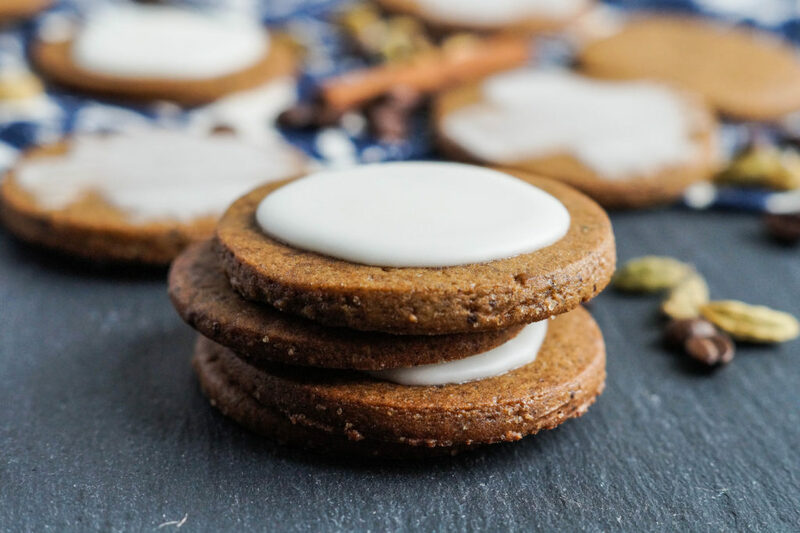 Dorie’s Cookies, written by Dorie Greenspan, features a variety of cookies and treats perfect for holiday baking, celebrations, and any other time of the year. From basic to international and sweet to savory, flavorful highlights include Salted Chocolate-Caramel Bars, Sweet Potato Pie Bars, Rose-Hibiscus Shortbread Fans, Chocolate Saucisson, Hamantaschen, Vanilla-Brown Butter Madeleines, Coconut-Lime Sablés, Honey-and-Tea Jammers, Puffed Grain and Miso Cookies, and Major Grey’s Roll-Ups. 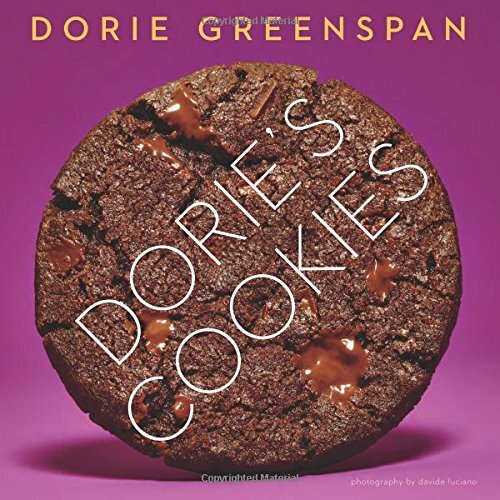 Dorie Greenspan is an IACP and James Beard award–winning chef and New York Times bestselling cookbook author based in Westbrook, Connecticut; New York City; and Paris, France. She has been writing cookbooks for over 25 years including Sweet Times: Simple Desserts for Every Occasion, Baking: From My Home to Yours, and Around My French Table: More Than 300 Recipes from My Home to Yours. She also had a cookie boutique in New York with her son Joshua called Beurre & Sel. Chapters are divided based on the type of cookie: Introduction; The Perfect-Cookie Handbook; Brownies, Bars, Break-Ups, and Biscotti; Cookies for Every Day, Any Day; Cookies for Weekends, Holidays, and Other Celebrations, The Beurre & Sel Collection; Cocktail Cookies; and Cookie Go-Alongs and Basics. This is quite the colorful book with many of the pages and backgrounds for the cookies in bold purples, yellows, blues, and pinks. The photography is provided by Davide Luciano with styling by Claudia Ficca. Every single cookie includes a full page basic photo of the finished product. Dorie begins with a guide to cookies from preparation and working with the ingredients to rolling, shaping, and baking the cookies. You will also find an overview of most common baking ingredients and tools. The book ends with a chapter on basics to accompany your cookies such as sauces, marshmallows, ice cream, spreads, and fillings. Measurements are listed in US Customary and Metric. All of the cookies include a headnote with background information and personal stories. I love that Dorie also includes notes for storing the cookies. A few of the recipes are followed with possible variations in flavor or style. This book is a great pick for those looking to add some variety to their cookie baking. 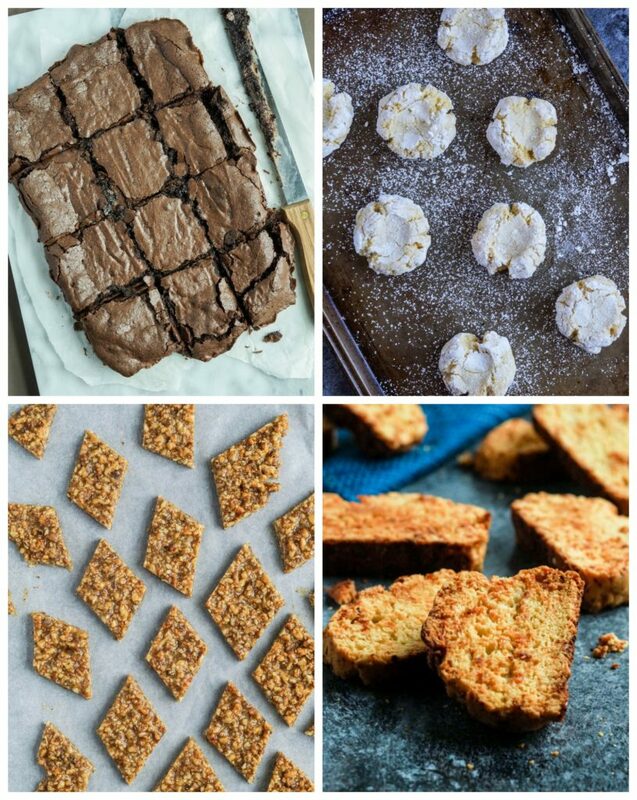 Brownies, bars, rolled dough, drop dough, sandwich cookies- Dorie includes a little bit of everything. I particularly enjoyed the addition of international cookies. There are also a few savory options in case you need a break from the sugar. The instructions are well-written and easy to follow. Most of the ingredients are readily available in the average grocery store. A few flavorings may be more difficult to find including brown rice syrup, miso paste, shichimi togarashi, rose extract, golden syrup, semolina flour, and orange flower water. A handful of the recipes also require specialty tools- Bruno’s New Year’s Waffles and Three-Way Sugar-Cone Pizzelles use a pizzelle maker, Devil’s Food Wafflets with Chocolate Sauce uses a waffle or pizzelle maker, and Madeleines use a special pan. 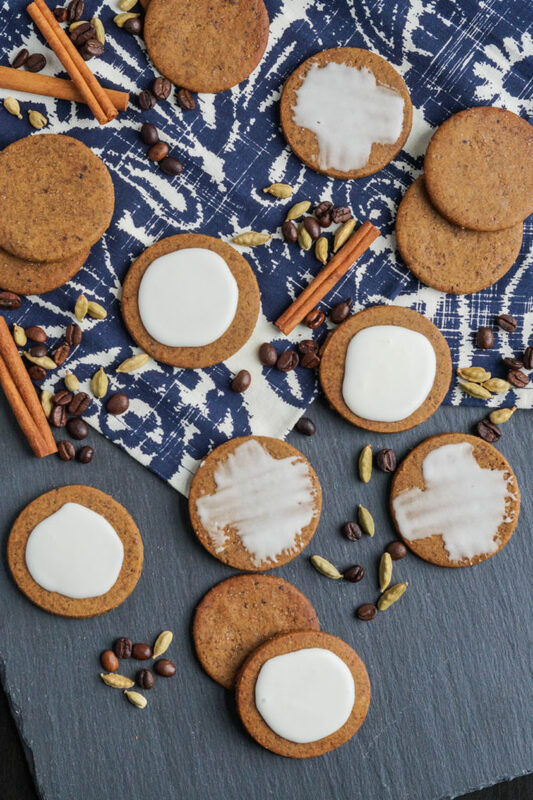 Coffee-Cardamom Cookies are spiced cut-out cookies with ground coffee mixed right into the dough. They are baked until crisp and topped with an optional egg white glaze for a little extra sweetness. Baking for 11-13 minutes will create a crisp cookie. To get a more chewy texture, bake them for a minute or two less. The rolled out dough can be refrigerated for 4 days or frozen for 2 months. The glaze can be stored in an airtight container at room temperature for 4 days with a piece of plastic in contact with the surface. The cookies will last for 5-7 days at room temperature in an airtight container or frozen unglazed for 2 months. Note: The glaze uses an uncooked egg white. Use only an egg source you trust. It is recommended that young children, those who are pregnant, and those with a compromised immune system avoid uncooked eggs. I also made Sebastian’s Remarkably Wonderful Brownies, Moroccan Semolina and Almond Cookies, Gozinaki, and Parm Toasts. Sebastian’s Remarkably Wonderful Brownies came from Dorie’s culinary pen-pal from Amsterdam, Sebastian. He developed the recipe as a baker in an Amsterdam coffee house. These chocolatey brownies have a creamy, chewy center with crisp edges. They were perfect for that chocolate craving. The Moroccan Semolina and Almond Cookies, Ghrieba, are one of the many international additions scattered throughout the book. These cookies have a semolina and almond base with citrus and vanilla flavors. They are shaped into balls, then a thumbprint in the center of each cookie before baking causes the notable cracks (known as smiles) to form around the edges. Pair them with mint tea for an afternoon treat. All the recipes I tried in Dorie’s book were delicious, but the Gozinaki were the most addictive. Just one bite and I was hooked. Gozinaki are a cookie/confection from Georgia (the country). Walnuts are toasted, chopped, and mixed with a hot honey syrup. The mixture is spread across a flat surface and allowed to cool before slicing into diamonds. Dorie also includes ideas for quite a few variations like Multi-Seed, Mixed-Nut, Orange, Dried-Fruit, and Chocolate. Parm Toasts and some others in the Cocktail Cookie chapter add a bit of savory in the sea of sweet cookies. These Parm Toasts are a savory version of biscotti with olive oil, white wine, and shredded Parmesan cheese. The dough is formed into two logs, baked, then cut into slices to bake some more. The resulting little toasts are a perfect base for ham, jellies, cheese, and other toppings. Disclaimer: I received a digital copy of Dorie’s Cookies in exchange for my honest review. All comments and opinions are my own. In a bowl, combine the flour, espresso, cinnamon, cardamom, and salt. In a large bowl, beat together the butter, brown sugar, and granulated sugar until smooth, about 3 minutes. Beat in the egg, then the molasses and vanilla. Scrape down the bowl and add the flour mixture. Mix (if using the stand mixer, pulse briefly to keep the flour from flying), just until the ingredients are blended. Cover a work surface with a large piece of parchment. Add the dough and shape into a disc. Cover with another piece of parchment. Roll the dough between the sheets of parchment until 1/4 inch thick. Slide onto a baking sheet and freeze for 1 hour or refrigerate for 2 hours. Place rack in center of oven and preheat to 350 degrees F. Line two baking sheets with parchment. Remove the chilled dough from the parchment and cut out as many circles as possible using a two inch round cutter. Place the circles on prepared baking sheets about 1 inch apart. Gather the dough, re-roll, and cut out more circles. Bake in preheated oven until toasted and firm at the edges, 11-13 minutes, rotating the pans after 6 minutes. Transfer to wire rack and cool to room temperature, at least 20 minutes. To make the glaze: Place the egg white in a bowl and lightly beat. Measure off half (15 grams) and beat until foamy (discard the other half). Use a spatula to mix in the confectioner’s sugar. Stir in the melted butter until smooth. If it is too thick, add a little bit of water, just until thin enough to decorate the cookies. Spread, pipe, or brush the glaze over the cooled cookies. To use a pastry brush: dip the brush into the glaze and pick up about 1/4-1/2 teaspoon, brush over the cookie in one direction, then across without re-dipping to form a crosshatch pattern. Repeat with remaining cookies. Allow to dry for 15 minutes before serving and 1 hour before storing in an airtight container. I got this book from the library a few weeks ago — I just love Dorie and there were several recipes that interested me, but I ended up not making any…. Guess I need to change that! These cookies look like lot of flavor and a little crunch. Just my style. Love the variety of ingredients & photos. Dorie’s cookbook sounds like it contains some good recipes utilizing some different ingredients. 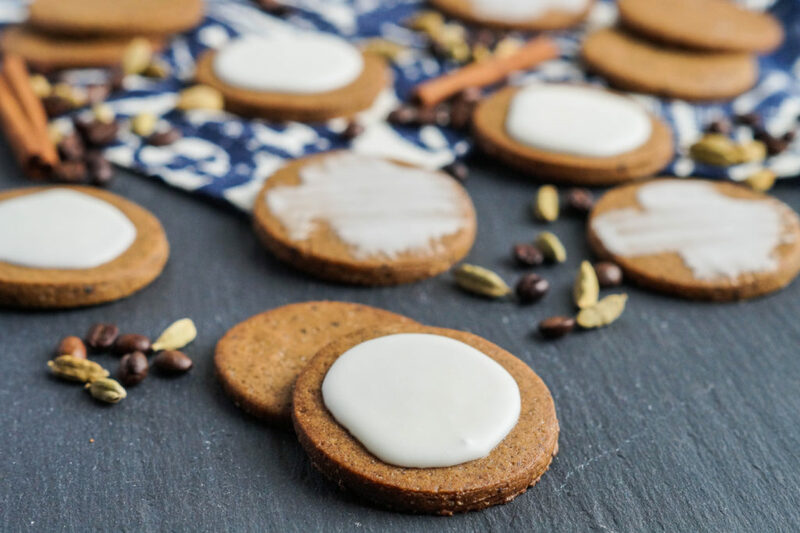 I love the use of cardamom in cookies as well as desserts. Such a unique taste. Theses cookies look great. These cookies look so good and I love the tip about rolling out the dough between parchment paper.